New books of any best selling author is awaited eagerly by his readers. Chetan Bhagat is the same case. I had read the prologue of 'The 3 Mistakes of My Life', which had been given in his site www.chetanbhagat.com. After reading the prologue, I had the option to send the link of the just read stuff to 3 more people by giving their e-mail adresses to get the Ist chapter for reading. In other cases, it would have been the case of spamming but considering Chetan and his credibility, I proceeded and read the first chapter, got thrilled and on the following weekend bought the book from Landmark, Forum, Bangalore. Chetan in his new book, has stuck with a story revolving around 3 friends much in the similar fashion as in his first book, Five Point Someone. But this time, the story is not from the corridors of prestigious IITs. As he says, it is from small towns like Ahmedabad. Anyway, I never thought Ahmedabad was a small town at all. As the book's synopsys says it is a book about 3 of India's passions - Cricket, Religion and Business, personified by the 3 characters - Ishaan, Omi and Govind. As in Five Point Someone, this story is told by one of the characters, Govind in first person. Though Chetan starts off with Cricket, story line turns into religious aspects quickly. Chetan follows up the series of India v/s England and India v/s Australia in 2001 and shows up how these 3 guys react to the match results and this forms the core of the story but there is nothing extraordinary about that as you would have already heard or seen yourself the live analysis, aftermath of the cricket matches in regular households. On the other hand, I felt most of the times that he is presenting the same old stuff about religion, churned out most often by the media again and again, which shows up only one side of the story. I also saw little merit in tracing Gujarat's history from 2001 which comprises earthquake, religious clashes etc, as enough has been said and it has been the hot topic of discussion in the intellectual circles of the country. What is disappointing is the same perspective of the state from India's west, thrusted upon by the media is reiterated by the author. But Chetan has attempted to be different when one of his characters says about Chimpazees kissing after the fight among themselves akin to religious clashes and that dialogue among people is what is missing in India in these situations. Cricket, a national time pass has also been seen from a businessman's point of view, which may be relatively new to the young readers. Businessman also sees religion in an agnostic point of view. The common glue which binds the 3 characters though they pursue different passions is cricket. Well, how can one forget the romantic part of the story, typical to Chetan's novels. Here too one of the characters falls in love with a girl and events which lead to this is presented in almost similar way in Five Point Someone. But Chetan here conveys some serious stuff yet jokingly. Happy ending is any author would love to provide to his readers after all the trauma and Chetan follows the tradition here too but with some sacrifices. One liners like his first novel are witty and worth 2nd read. All in all, it is not a must read but can be useful if you can take the real jist out of the full write up. This post is a brief account of my experience as a spectator in the IPL match between Bangalore Royal Challengers and Delhi Daredevils held on 19th May 2008 at Chinnaswamy Stadium, Bangalore. Background: I had never been to any cricket stadium to watch a live match. But Sandeep’s josh transformed me to go for one, that too for the wholesome entertaining IPL match(not exciting enough though, as our home team Bangalore Royal Challengers was on a loosing streak). But the tickets had been booked by Sandeep long back when he was on a business trip to Paris and when in Bangalore you have no choice but to go for the match in which one of the teams is always Bangalore and you may expect less fireworks from them. Sandeep had bought 2 tickets for the Bangalore v/s Delhi match on May 19th but his colleagues had also booked ticket for him for the same match. Now, he had an extra ticket. He asked me whether any of my friends were interested to join. That’s when I called Deviprasad, a cricket freak. He instantly accepted the invitation and we had a big team now around 10 people to watch the match. But it was only when Sandeep saw the tickets booked by his colleagues, he realized that our stands were different. So, I and Devi headed for our stand which was McDowells Best View(Stand A). Initial Proceedings: I had left office early to reach Chinnaswamy stadium as you never know with Bangalore traffic. Though Devi had told he would be around 6 PM and me much earlier, he was the first to reach the place. With rain pouring heavily and Sandeep and friends still on their way, we decided to go inside the stadium. I was skeptical whether we would have a game at all with all those rains and if it all it stopped raining whether we will have a full match. Routine security checks were in place and one of the security personnel wondered about the rechargeable batteries I had carried in my bag. I told it was for the camera and he seemed convinced. Well, we were now inside the stadium with early birds already occupying strategic positions i.e seats! Shaan Show and the Laser Show: Fortunately, rain had stopped around 6 and that was precisely the time when Bollywood singing sensation Shaan’s programme will start. Shankar Prasad, well known face of the Bengaluru Doordarshana Kendra was the host of the show. He began with his impeccable voice addressing the crowd both in English and Kannada, “Ladies and gentlemen”, “Mahileyere mattu Mahaneeyare” respectively and told Shaan will be entertaining us with bollywood numbers and some Kannada songs too. Shaan dressed in white coat and white pants entered the stage SRK style (Don theme), with the thunderous applause and began his bollywood numbers with ‘Mai Hun Don’. ‘Chand Sifarish’, ‘Do you want a partner’, ‘Jab se tera naina’, ‘Dekho Dekho Kya Yeh Pedh hai’ followed. He also sang one Kannada song – ‘Eno Onthara Ee Preethiyu Ee Reethiyu Shuruvaada Aa Nanthara’ from ‘Hudugaata’. He ended his show with his ever green album melody ‘Tanha Dil’ wishing the home team all the best, telling repeatedly that he would be lucky for the team but that was not to be. After Shaan’s show, Laser Show followed. Lasers with background score filled the entire stadium with exclamations from the audience. It was really awesome; have look at the videos below. Toss and the Star Entry: Stadium does look big when you watch in TV but when you were in middle of the action here, it seems a small place and Devi had the prospects of hitting sixes off any bowler, given a chance comparing the ground to the one he played in his school days in Hebri! We really missed the binoculars as without them you would be waiting for the giant screen replays to watch what exactly happened in the previous delivery. Well at around 7 30, Sunil Gavaskar made his entry to the ground with 2 captains – Dravid and Sehwag. Sehwag called it right. When asked about the match Dravid fancied his team’s chances of spoiling somebody’s party as his team was almost out of the tournament. Soon after the toss was over and match was about to begin, Kannada actors Upendra and Ramya were up on stage. Ramya began with her somewhat foreign accent Kannada saying ‘Namaskaara Bengaluru ‘ and Upendra greeting which he followed up with his own style dialogue ‘Fouru Sixu Ok, Kuttodu Yaake!’ indicating how Bangalore team was adapted to defending while batting rather than hit the ball t20 style and then they jogged around the ground saying ‘Cheers to Live’, making the crowd stand up and take notice of their presence. Cheerleaders: Toss time also marked the entry of much debated cheerleaders to the stadium. They first performed in the middle of the ground, then jogging round the ground cheering the audience and finally to settle down at the 3 podiums destined for them. Needless to say all these events were received with high volume cheers for the crowd gathered. Cameras clicked, videos shot and the attention turned to one side of the ground. Cheerleaders used to dance for English, Hindi, Kannada songs whenever the home team hit 4’s and 6’s or took wickets. But they were left with plenty of spare time without work as the home team hit boundaries in patches and took only half of the Delhi team out. Match and the Audience: Not terribly disappointed by the home team’s performances in earlier games, crowd cheered the team to lift their game up. Posters, Banners filled the crowd space but only that cameramen were not interested in any of these. Posters created by me like – ‘Put the Bang back ‘Bang’alore’, ‘Dravid V R With U’, ‘Don’t Mis-bah-L’, ‘Go 4 Hit Swamy’(for Srivatsa Goswamy, the debutant), ‘White Wash Delhi’(for Cameroon White) remained visible to the minority of McDowells’ Best View(Stand A) people! Also, these posters were of not much use after some time as Dravid, Goswamy, White were on their way to pavilion after I prepared these posters, with the exception of Mis-bah and Goswamy(who had a good outing on that day). Well, cameraman was more interested and focused on the airhostesses who had landed upon the KSCA ground on that day! The Live Action: There are no live commentaries in the stadium; how can it be, with the audience noise level crossing several decibels. 2 giant screens provided us the status of the match as we were interested in the stats occasionally. But the lack of hard hitters in Dravid’s team made the match less T20. Misbah’s last over fireworks to produce 24 runs was a treat to watch. Anyway, crowd enthusiasm made up for this and evey four and six was cheered whole heartedly by the audience and being among this bunch gives yourself a different kind of experience altogether. Like waiting for the third umpires decision and after his verdict the cheer; you have to be in the crowd to experience that. Well, nowadays they don’t show action replays to get our own versions of verdicts, thus avoiding controversies. First half of the match was Ok. Though Bangalore kept loosing wickets, 19 year old wicket keeper Srivatsa Goswamy provided complete entertainment, who finally perished trying to go over the top. But then Misbah was there to play his best IPL innings so far. On the way he also did a Inzamam-ul-Haq when he got involved in 2 of the runouts. 2nd part of the match was interesting only to the Delhi crowd as Sehwag and Gambhir hit boundaries after boundaries most of the times never bothering to run. But then Delhi also had their anxious moments; once the openers were out they lost 3 quick wickets courtesy Kumble and Steyn making the crowd interested in the match. But soon enthusiasm died as Delhi roped home comfortably winning the match by 5 wickets. In the meantime in the 2nd half, when match was dull, somebody from the crowd in McDowells Best View(Stand C), the stand where Sandeep was seated, started dancing and all the attention turned there! After the match was over, we did not wait for the presentation ceremony to get over and were on our way back home at around 11 30 PM, discussing had it not been a huge first wicket partnership for Delhi, we would have possibly won it! All Tulu drama enthusiasts in Bangalore, can mark next Sunday(25th May 2008) in their dairies, as there will be 2 Tulu comedy dramas staged at Ravindra Kalakshetra, Bangalore on that day. 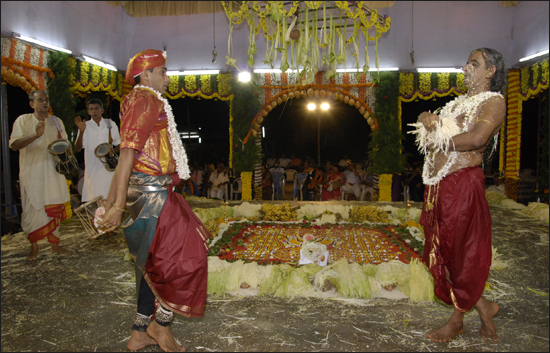 'Kutumba' and 'Madime' are the two plays, both directed by Tulu drama veteran, Vijay Kumar Kodialbail. Vijay Kumar Kodialbail is an eminent Tulu theatre personality and was the director of hugely popular Tulu comedy drama in the 90s - 'Oriyordori Asal'. 'Oriyordori Asal' had some big names in Tulu theater like Anand Bolar(as Coporator Kanthapanna), Naveen D Padil (as Bhajane Master Basappanna), Bhojaraj Vamanjoor(as Lingamakka). I used to listen to the cassettes of the Tulu dramas at home at that time and used to imagine the scenes. Anyway, dialogues usually had the punch rather than the actual scenes, I thought. That was the second drama I had listened to after 'Aatada Ulayi Aata'. 'Aatada Ulayi Aata' was an unique experiment as it was a nice blend of Yakshagana and Drama. I have not seen/listened to any other plays directed by Vijay Kumar Kodialbail off late, as there are also 2 other theatre groups in Mangalore active now, one lead by Naveen D Padil and the other by Devdas Kapikad. Last Tulu comedy drama I watched in Bangalore was 'Anchilathth Inchilathth', in July 2007, performed by Lakumi Kalavider, a troupe by Naveen D Padil at Town Hall, Bangalore. Dakshina Kannada Kulala Sangha, Bangalore has organised this show in association with Ranga Spandana. For 'Kutumba', this is the 100th show. Here are the details of the two plays. Forget those nightmare journeys travelling via Charmadi Ghat to reach Mangalore/Bangalore. Come June 1, you will be in for a pleasant drive in Shiradi Ghat in NH 48. According to Mr.Sudhir Krishna, Principal secretary, Department of Public Work, the newly laid Shiradi Ghat stretch will be ready by June 1. Finally some relief for the people commuting between Bangalore and Mangalore. Bus breakdowns, traffic jams in Charmadi Ghat was a common sight when most of the traffic was diverted from Shiradi Ghat. One was always expected to have a lot of time at his disposal, if he is travelling by this route as there was no fixed time to reach the destination. Sampaje ghat route via Madikeri, used by KSRTC volvo service and Kerala state buses(travelling to Kasaragod) was no better. People travelling to Kundapur used to avoid Charmadi ghat route by catching the train to Shivamogga from Bangalore and taking bus route from there. Well, Mangaloreans did not have this work around to avoid the unpleasant Charmadi Ghat travel. But with the introduction of Mangalore Bangalore train, there might have been some relief if one had booked the train tickets in advance! I have travelled both via nightmarish Charmadi and Sampaje ghat routes and yet to experiment with newly introduced train route! Twice I had to catch the another bus after the bus broke down in Charmadi Ghat and dont ask me the number of over time journeys to Mangalore solely because of the traffic jams in the ghat section because of the slow moving and overloaded trucks. It may be however remembered that light vehicular movement was allowed some time back in Shiradi ghat and the taxis, tempo owners made quick bucks by alluring travellers with the assurance of 6 hour journey to reach Bangalore. Yesterday, one of my relatives who had come in his vehicle was very happy about the repair work with all those smoothening of curves and widening of the roads in the ghat stretch. Overloaded trucks and tankers were the prime reasons for this National Highway's pathetic condition. It was not only the ghat section which got damaged but the BC Road to Mangalore stretch was also in the same condition. It is nice to know that the NH48 will be soon converted to four lane with Centre's approval. Atleast now, there should be vigil on overloaded trucks, tankers moving in Shiradi Ghat route, voilating the loading norms and in turn, damaging the roads. Third in this series of Mangalore Beaches is Panambur beach. Panambur beach is 13 kms away from Mangalore city center, Hampankatta. It attracts more visitors than the other beaches in Mangalore like Someshwara beach or Ullala beach, primarily because of New Mangalore port nearby and being near to the city. If in Someshwara, Ullala beaches local crowd form the majority, people from outside Mangalore gather in Panambur. Apart from the usual fun frolicking at the sea shore, there is a new attraction nowadays at Panambur beach. Camel rides, which I am referring to, is offered by the north Indian dwellers. Beach is clean with stone benches inviting the nature enthusiasts to sit and enjoy the ever beautiful sun set. Facing the sea are the coconut trees whose branches swiveling in the winds form one of the best sights to the onlooker. That apart, walking along the very fine sands of Panambur beach is really fun. Nearby the beach is the New Mangalore Port, the pride of Mangalore and gateway to the state of Karnataka. It is an all-weather port which handles liquid chemicals, hazardous cargoes, crude and POL products, heavy lifts, machinery, containers. Prior permission is required to have a visit inside the port. Panambur also houses Mangalore Chemicals and Fertilizers(MCF)(now owned by UB Group of Vijay Mallya), as well as pelletisation facilities of Kudremukh Iron Ore Company Limited(KIOCL). When at Panambur you will find Gaali Mara(not sure of the equivalent name in English, Gaali Mara, in Kannada literally means wind tree which has almost non existent leaves), is the most common form of flora here. Signboard near the beach entrance advises tourists against swimming in the sea. Also at the beach entrance, you will find eateries. Sunset at Panambur beach is one of the best. When I went to Panambur, couple of weeks back, sun was just beginning to set. Photo enthusiasts were seen capturing the sight of sun submerging in the sea. Though rainy season was on in Mangalore, it did not rain on that day, giving me an opportunity to capture sunset moments. By Bus - service buses from Mangalore towards Surathkal ply via Panambur frequently. From the bus stop you can avail Auto Rikshaw to reach the beach which is about 2 kms from there. By Auto/Taxis - Hire Auto/Taxis from Mangalore city.